hey, Tempe-based Asleep in the Sea will be playing at Beerland on Saturday night. Tom Filardo is my student worker. Go see his damn band. I have a hard time throwing things away. I have a great time accumulating baubles and hoo-hahs. A lot of people are surprised we aren't planning to move into a rental place until we find a house. "Put it in storage" they keep telling me. It's not that I can't bear to think of my comics living in Public Storage for a year or two. Rather, I'm much more concerned that if we rented, then bought a place and moved again, it would mean I would have to move all of this junk twice. That's a lot of heavy lifting without the help of the surly moving guys who we plan to hire. Why surly? I have learned in my moves that the moving guys will hate me for moving what is essentially boxes and boxes of paper. Paper is heavy, Leaguers. Maybe not "box of lead" heavy, but it's almost water heavy. There's few things that runs a chill up my spine more than the look of desperation rolling over the face of the movers when they see my comics. As much as they don't want to have to lift all that weight, I don't want for them to manhandle those boxes of precious, precious comics. Or my toys. Or, you know, my amazing statues. Such is the fate of the mover who takes on our house. Sure, we're not exactly moving the Library at Alexandria, but I guess most people don't intentionally keep crates of paper around. Or books. Please love my comics, too. We met with our final realtor last night. The bottom line is that we should have sold last Spring if we wanted to make the big bucks. Now it's going to be a game of figuring out how to still make money, but price the house low enough that it can move faster than the other houses in our neighborhood. (our neighborhood has a total of 6 models, I believe, with 2 or 3 around our same square footage). So if we were to undercut everybody else, we might move our house a lot faster. I feel okay about that as I think all we're doing is beating everyone else already on the market to an inevitable sales point. On the other hand, we might also drive down the price of every house in our neighborhood. Well, maybe they should have thought of that before they didn't talk to us for the past four years. Screw you, neighbors! I just want to sell and go. Is that so wrong? My boss posted my position yesterday. I was curious as to how the job would read, and while I would have flip-flopped the order of the responsibilities listed, I thought they came up with a surprisingly accurate description of what I do. Sort of. They didn't include the "Shadow Puppet Theatre" I like to do when the projector is turned on in the conference room. The description also does not include that in April I was named the Assistant Fire Chief for my office. No, really. If our Admin Assistant is somehow unable to perform her Fire Chief duties, I am next on tap to usher my co-workers out of the building. Who shall convince the Director to get off the phone when the alarm goes off if not I? Because that happened back in February during an actual fire. Guy wouldn't get off the phone and there were flames in the elevator shaft. That, Leaguers, is dedication. Jim D. has suggested I write a novel or meoir or something regarding the move. I have mixed feelings on this as I sincerely hope that nothing exciting enough to warrant a novel will happen during my move. Is it too much to hope for a smooth transition? Hey, your lifestyle isn't as fabulous as it should be. No, seriously, trust me. It's not. But you, yes, YOU can live la vida loca every day with items from the League of Melbotis Store! 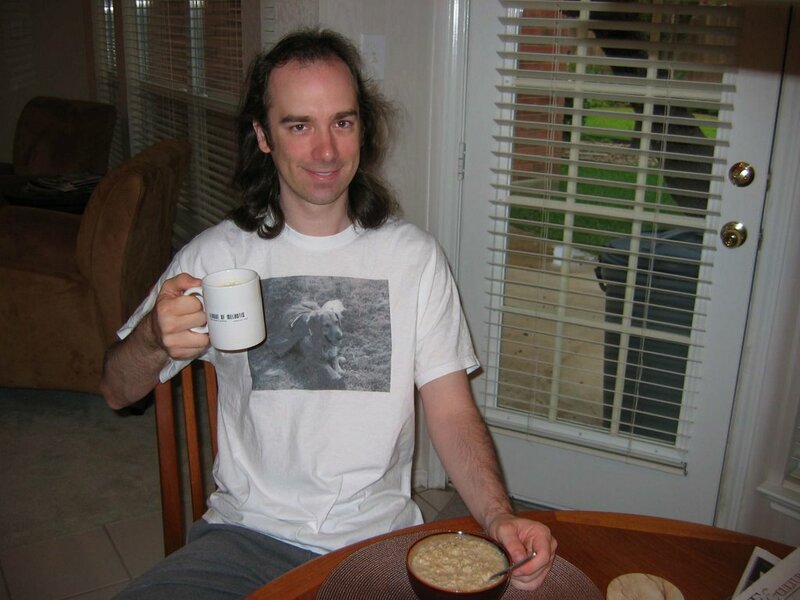 Here's Loyal Leaguer Nathan Cone sporting his LoM threads and sipping his usual morning mix of wood grain alcohol and 409 from a niftier-than-all-heck LoM coffee mug. See, Nathan's life is now way, way better. So head on down to the LoM shop to see all the neat stuff you can get. it's not just League approved, it's League produced. I talk a lot about Superman here at LoM, but as Jamie will roll her eyes and tell you, my interests go far beyond just The Man of Steel. For some reason I've never been able to put a finger on, I dig Mister Miracle. Across a dimensional barrier and/ or in deep space, there are two planets constantly at war with one another: Apokolips, ruled by Darkseid, a despot who defies even the darkest definitions of cruelty and evil*, and New Genesis (capital, floating city: Supertown), a peaceful, green world which is inhabited by the New Gods and ruled by the benevolent hand of Highfather. It doesn't take a master reader to decipher that Apokolips is where all the bad cosmic guys hang out and New Genesis is home to the celestial beings in white hats. It probably also won't come as a suprise that the stories surrounding the characters of what is called "Kirby's Fourth World" are usually broad in scope, but the currents always seem to run deeper than the slug fests you found in other comics. 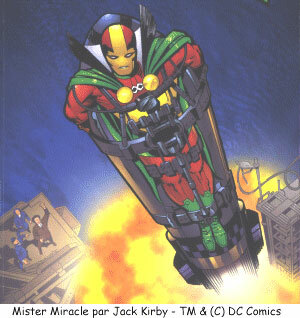 One of the many characters which spun off from Kirby's Fourth World is Scott Free, aka: Mister Miracle. The son of Highfather, raised in the Armaghetto's of Apokolips, Scott Free dreamed of only one thing: escape. The antithesis of the vision Darkseid has of crushing and subjugating the universe, Scott Free was the only being ever to escape from Darkseid's twisted planet. He came to Earth where he now uses his tremendous talent to entertain as showman, Mister Miracle, but also as a proud member of the JLA. Mister Miracle is (and, again, I suggest you read his back story to find out why) THE WORLD'S GREATEST ESCAPE ARTIST!!! You can read about Mister Miracle here (and I suggest you do. He has one of the coolest back stories in comicdom). And here (this one is better than Wikipedia's entry). Today I feel like Mr. Miracle. Almost, but not quite. I feel like Mr. Miracle in this picture, anyway. I've voluntarily strapped myself onto a roaring rocket, bound for certain destruction, and even if I do get free of the rocket I'll be entering the stratosphere, bound for a free fall. Today I am Mr. Miracle. See him strapped to that rocket, looking maybe a little stressed, but not overly concerned? He's Mister Miracle. He's survived the Orphanage of Granny Goodness, he's survived the firepits of Apokolips and he broke free of the world which stands outside space and time, existing to do nothing more than break the will of its denizens. In five seconds Scott will produce his multi-cube from his glove-pocket, shoot a laser into the tumbler of his manacles, do the same for his leg locks, leap clear of the rocket's flame and then float to freedom on his cape, which will have billowed out to become a parachute. 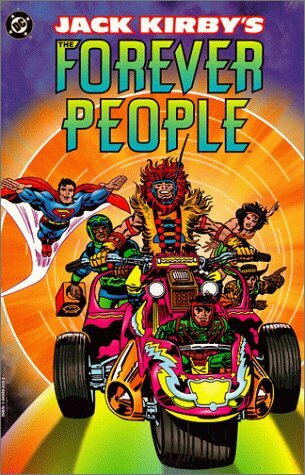 I never had any firepits or Granny Goodness breathing down my neck. The Admiral never swapped me off to his nemesis to resolve some ancient dispute. But today I want to be Mr. Miracle. I want to know that I'm going to jump free and clear in this whole contraption I've set for myself, touching down on solid earth with a wink and a nod to my faithful wife. Today it's all about the complexity of the escape, but if Mister Miracle can make it fun, so can I. Right? Maybe? As much as Orion, the Forever People and the New Gods always seemed so straight forward (well, maybe not The Forever People), Mister Miracle wasn't out to fight anybody outright. 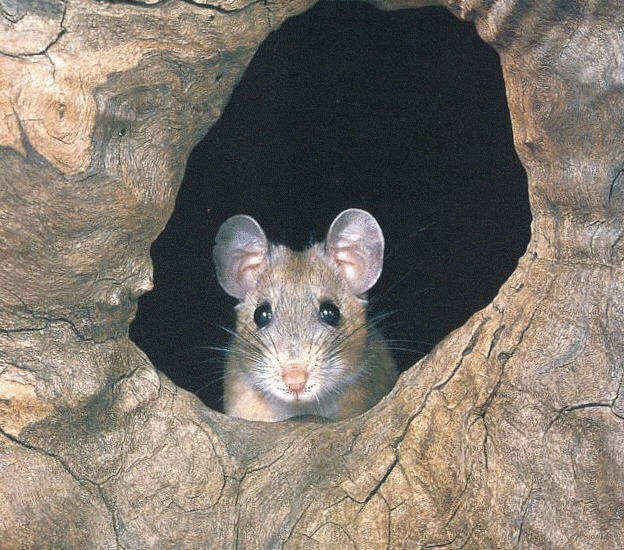 Instead, he was out to escape the unescapable, defy the undefiable. Years later, Michael Chabon would refine the idea and produce the greatest superhero the world had never seen in The Escapist, the fictional comic character of his novel The Amazing Adventures of Kavalier and Clay. And maybe I read too much of Chabon onto Mister Miracle. I'm not sure. It's possible Kirby never meant for Mister Miracle to be a walking allegory, but with Kirby, who the heck knows...? All I know is that as surely as Scott Free dreamed and dreamed of breaking loose of the chains of Apokolips, I mean to shake off the dust of this one horse desert town. And if he can do it, then maybe I can do it. Just like Steven can do it. And maybe you can, too. So for the next few months, if you see me donning a lot of red, yellow and green and occasionally trying to get put in a lock-box so some burly men can toss me over the rail of a ship, don't you worry about me. I'm just seeing exactly how you do this escaping thing. 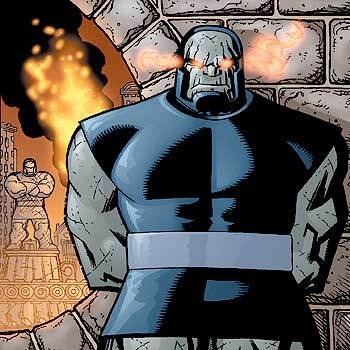 *Readers of LoM may be interested to know Darkseid and Apokolips appeared in comics just a few years prior to Lucas coming up with Darth Vader and the Death Star. Lucas famously perused comics while coming up with his story. I've heard Kirby considered suing, but Lucas had tweaked the concepts enough that Kirby knew the passing similarities wouldn't hold up in court. Sunday night we headed over to some friends' house for a sort-of "Well, we're leaving" chat and dinner. It's always been nice hanging with Ryan and Trisha, but two years ago they had a kid, and, up to this point, I had no idea that the reason people have kids is for the free entertainment. Isaac is almost two. He's a wee man who likes to use his head as the base of a tripod before performing some awesome somersaults. He's mostly into Elmo and the Wiggles these days, but he's also into loose change and whatever chips he can get his mits on. He seems smarter than the average bear, which should surprise nobody whose ever met his folks. He's got somethign going on with his legs, and he needs braces right now, but he's two and he's like a combustible ball of energy, so what does he care about the braces? Isaac's still in motion. As proof positive that Ryan N. is a quality dad, he's found a ceiling fan for Isaac's room that is the propellor of an F-4U Corsair, with the iamge of the Corsair on the ceiling. I am now jealous of a two year-old. Jamie will never let me put up that sort of fan in the bedroom. We spoke with our first realtor on Sunday, and I liked her a lot. Having never sold a house before, it's hard to tell if someone is ripping you off or telling you things that you want to hear before they put the screws to you. We're taking a pass on a realtor we found online and we're talkign with a recommended realtor on Thursday. Must get house on market. Must sell house. I have 330 hours of vacation built up. Apparently, after speaking with higher powers this morning, most of that vacay will disappear into a howling void, just like my late 20's. I'll get something like a month paid out, but that's 160 of my 330 hours. I would have preferred a big old bag of gold coin, but what are you gonna do? My boss is trying to be cool about it and help me out. As mentioned, I have no job lined up awaiting me in Austin. It would be nice were things otherwise, but they aren't. Fortunately. friends and Leaguers have already volunteered to come to my aid. Not having a job lined up is not unknown to me. When I graduated I went months without full-time work. When I arrived in Phoenix, I had nothing in particular lined up. So finding out who will take me on becomes a waiting game. I don't mind interviewing. I guess I feel like I'm interviewing my potential empoyer to see if this would be, in fact, a good fit for me as well. If they feel I should be coming in grovelling, well, maybe me and that work place aren't going to get along too well. My co-worker Juli asks me about once every six months: If money were no object, what would you do for a living? The idea of the thought exercise is that you're supposed to come to some realization of your true calling, give up your work-a-day job and go chase that dream, whether it's driving a shrimp boat or auditioning for community theater. I have never, not once, come up with an answer to that question. It's too huge. And I think I'm painfully aware that aside from being Grand Sultan, every job is going to have it's drawbacks. And even Sultan's need a food taster to keep them from being poisoned by scheming underlings. Two years after college, my parents and I were having a similar conversation, and at the time I responded that "I would like to do nothing. I would like to sleep late and stay up late and read. And watch TV. Probably a lot of Discovery Channel. And maybe, I dunno, go to Barton Springs when the weather was nice." Because at the time, that's what I wanted to do. My parents went into some sort of tizzy, my mother cursing my inherent sloth, my father lecturing me about the value of a good work ethic. But I think even I missed my point. It's not that I literally would be happy not working, or being a bum who lives somewhere near Zilker. I jist want to be able to do those things once in a while. And back then, I wasn't getting to do them. I graduated with an RTF degree and it's not that I didn't want to work on films, it was that I didn't want to work on bad films. And dumb commercials. And corporate in-house birthday videos celebrating some poor schleb who would probably be fired when the stock took a downturn next quarter, anyway. So I went to work for the state, figured I get a little money in my pocket and health insurance. And I really, really dug my office. My job was sort of goofy and it was okay. But I liked my co-workers and I liked what we did. Since then, even with a new job in a different city, the work has been good to me, and I think I've been good to it. I think I'm actually effective at my job, and I think I make things run fairly smoothly. So what do I want to do with my life? My options are open, Leaguers. I'm an open minded guy. I wish I could say "I am a CPA with five years' experience and am worth six-figures." But I'm not. So what do I want to do with my life? I still want to sleep late on Saturdays and stay up late reading comics. I still want to watch Discovery Channel and hit the pool when it gets hot out. I want to make things that I don't find embarassing. I want to be a part of a team of people who actually care about one another and the health of the office. I want to be a part of a team where people like what they're doing and who they're doing it for. I'm flexible. I'm happy as long as I'm busy. I want to be able to laugh at the water cooler and wear jeans to work when I feel like it. And for nobody to worry about my Superman mouse-pad or my Batman clock. I dunno. It's going to be fun. I'm looking forward to seeing what's out there. I feel like there's a world of opportunity. Hopefully nobody with better qualifications is going to beat me to the punch. League of Melbotis personally responsible for Mattel's recent windfall. I was in Austin by Thursday night. Peabo and I dropped my bags, said goodnight to Adriana and hopped over to Kerbey Lane on S. Lamar. The people are all so young inside. You forget out here amongst the families and a-dults that there's this other thing going on. The service is no better at Kerbey Lane now than in 1996 or whenever it was I first hit that location. Peabo, though, has landed himself a beautiful home in my neighborhood of neighborhoods. I'm afraid to ask how he swung that. He's got a little schnauzer, Homer, and I'd like to say that Homer and I really took to each other, but I sort of get the feeling Homer is a dog who is going to love anybody willing to play with him (not that he's want for attention). Friday morning was the graveside service. The Memorial Park is lovely in that all-encompassing-green way that the older neighborhoods in Austin tend to be. It's oaks and spanish moss. Afterward I stopped by Jason's house and then the Wilson's for a few minutes. Then off to my old office on campus at UT where time seems to simultaneously never progress and lurch forward in hops and leaps. They've painted the walls. People have left, people have joined. New furniture. New hardware. New technology. No small amount of jealousy, there, given what they're playing with. Ran back to Jason's, met up with my parents, Sue and Jason. In separate cars we headed over to the Umlauf Sculpture Garden. And people showed up. Lots of people. Reedo, Larry Lee, a sea of attorneys. I'm still hesitating to guess how many folks. Afterward, off to Threadgill's with the folks and Sue. Then back to Peabo's where we stayed up until 1:30 AM or so. I miss that with Peabo. If ever a man got my mental wheels spinning, it was that guy. We've been staying up too late since 6th grade, I think. This morning I was up and out the door before Peabo & Family were up. Wagner picked me up, we hit Maudie's for breakfast, floated around the WestGate area for a while not wishing to wake the guys at Jason's house whom Greg informed us had made a night of it last night, and stayed up entirely too late. Said my adios to Wagner, met up with the family, had some lunch at Casa G's (I know, I know...) hit the airport. My flight was delayed, which was problematic. You see, last night at 10:00 or so, for some reason The Admiral mentioned that this evening was the 15th. For which I had Lyle Lovett tickets and had completely forgotten. Long story short, mother nature and ineptitude of both Southwest Airlines and the Las Vegas airport (which had sent my craft) conspired to prevent me from making it home in time. I missed the darn show. Sorry, Lyle. All these folks who have been nothing but a name or some folks I had only heard about in passing... two things. There's nothing like meeting someone you've never met before and them taking a look at you and saying "I saw you eating Cap'n Crunch!" Or, "We saw you and your brother drinking Jones Soda!" I finally met some folks I'd corresponded with only through this oddity we call the internet. Hello, Diva. But, but, but... it's not just the League, thank you, Steanso... Over at Adventures of Steanso, my brother dearest occasionally refers to me as "Roundball". The name has no meaning, and was used briefly in reference to a book I read in 3rd grade called, I believe, "Anastasia Krupnick." Anyway, apparently Steanso's Austin based-pals believe my name to be "Roundball". Just as they believe my parents' names to be "The Admiral and KareBear". Now I mention this as I am now not sure what the future holds. Jamie and I have decided that in very short order we are placing our house on the market and we're moving back to Austin. If any of you have a job you would like to give me (I require a 6-figure salary, four weeks of vacation, an expense account and a company car), I'm game. We plan to be back in town before ACL Fest and just as the summer heat is scheduled to break. I want to be back in Austin for a lovely Austin fall, all football games and bright sun and those wonderful Northers blowing through once in a while to remind you that winter will be along shortly. This has been a surprisingly easy decision, but it's turning into the monumental task that I said it would. But remember what I said back then? No limits. This is the right thing to do, and if I was ever unsure of my choice, the past forty-eight hours has been frought with a thousand whisperings telling me that it's time to get on with it. So I'm a'coming, Austin, Texas. Me and the whole, darn League of Melbotis. No limits. So when I get back, and I'm back in my home town, do I have to worry about attorneys on the street leaning out their car windows and shouting "Roundball's back in town! "?